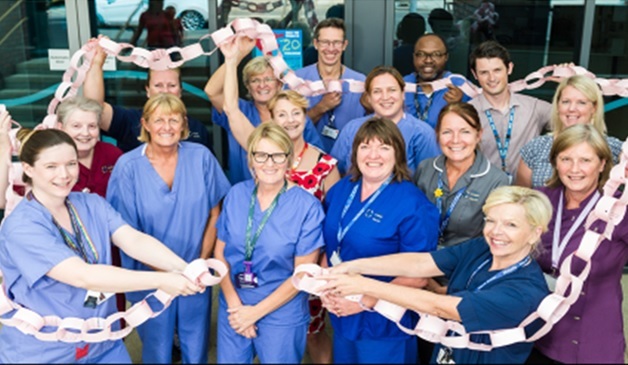 The Maternity Team from Cardiff and Vale University Health Board have been shortlisted in the Nursing Times 2018 Awards for their work in lowering caesarean section infection rates. The nursing profession will come together at the Nursing Times Annual Awards ceremony in October to recognise, reward and celebrate the best in nursing. The Maternity Team were reported to have had a poor rate of infection in those having a caesarean section. However, the team did not have the evidence to challenge this outcome as the reporting system was not robust. Using service improvement methodology, the team looked at the process, identifying systems and clinical issues as well as using small step change to evaluate. The Maternity Team now have the lowest infection rates in Wales and the highest compliance with return of reporting information. The winners will be announced on the evening of recognition on Wednesday 31 October 2018 at the prestigious Grosvenor House Hotel on Park Lane. Ruth Walker, Executive Nurse Director at Cardiff and Vale UHB said: “I feel extremely proud that the Maternity Team have been shortlisted in these prestigious awards which recognise excellence in Nursing. Take a look at the shortlist.